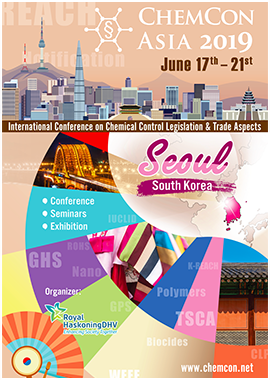 The exhibition for ChemCon Asia 2019 will be open from Tuesday 18 June – Friday 21 June 2019. Set up will be on Monday 17 June 2019. To enable your company to have the best possible contact with the delegates the exhibition is situated in an area (several rooms on the same floor as the conference sessions) where all coffee and lunch breaks will take place. All other equipment has to be provided by the exhibitors themselves. Renting of additional equipment via a local supplier is possible (in this case please notify the conference organizer). Concerning the overall handling of the exhibition, please see also the exhibition regulations and general regulations (available on request). The number of representatives of the exhibiting company is limited to four persons per day at the stand. Please be aware that registration for taking part in the conference sessions has to be done separately. Exhibitors receive two free tickets for the social event (Wednesday 19 June 2019).